The Linksys WRT54GS Wireless Router with SpeedBooster incorporates the next generation of Wireless-G (802.11g) networking. SpeedBooster technology is a compatible add-on to standard Wireless-G, which increases "real-world" wireless network performance by up to 35%. Unlike other speed-enhancing technologies, SpeedBooster is fully 802.11 compliant, and a "good neighbor" to other wireless devices and technologies, using a single 2.4GHz channel as specified by the official wireless standard. And, unlike other technologies, with SpeedBooster you'll see an overall speed improvement even when running a mixed network of SpeedBooster and regular Wireless-G devices. This router is really three devices in one box. It means this is Wireless Access Point, which lets you connect 802.11g or 802.11b devices to the network. There's also a built-in 4-port full-duplex 10/100 Switch to connect your wired-Ethernet devices. Connect four PCs directly, or daisy-chain out to more hubs and switches to create as big a network as you need. Finally, the Router function ties it all together and lets your whole network share a high-speed cable or DSL Internet connection by using Port Address Translation (PAT) technology. The new push button setup feature makes it easy to configure your wireless devices. Just push the button on the Linksys WRT54GS router and on your other SecureEasySetup-enabled wireless device to automatically create an encryption-secured wireless connection. TKIP and AES protects your data and privacy with up to 128-bit industrial-strength encryption. The Router can serve as a DHCP Server, has a powerful SPI firewall to protect your PCs against intruders and most known Internet attacks, supports VPN pass-through, and can be configured to filter internal users' access to the Internet. Advanced configuration is a snap with the web browser-based interface. I will say...it is simple to setup, and with superb performance. I have nothing but good things to say about this item. I can't believe that there is not one review on this item yet. After struggling with the D-Link DI-624 & all of its included problems for about 3 weeks I decided to return it. Those were the worst 3 weeks of my life. The router would reboot every few minutes, & would disconnect every time the phone rang. The very worst part of all was that the D-Link PC Card would freeze my notebook with no way to properly shutting down. I even tried the new Netgear card with the same results. At this point I had given up on wireless, & switched back to using cables. About a week ago, my girl showed up at my doorstep with an Amazon box. When I opened it & saw what was inside. I said to myself, oh boy here we go again, & to my surprise it was nothing like that. Everything went smooth as silk, from beginning to end. The best experience I have had in a long time. The router it self is very well built & sturdy, unlike the D-Link. I guess it's true what people say, you get what you pay for. For anybody in the market for a wireless router, I would highly recommend you spending a few dollars more & getting a quality product from a well known company like Linksys / Cisco. The installation was a no-brainer, & the configuration process was just as easy. The configuration wizard walks you step by step & explains what each setting does. Till this day, I haven't had any problems with reboots or disconnects when the phone rings. The best part is my Linksys PC Card doesn't freeze my notebook, & does have slightly better range than the D-Link. Another thing I love about the router is that it has all the bells & whistles for those who like playing with the advance settings. The transfer speeds are slightly faster than the D-Link's, but I really doubt they even come near of what they claim. All in all I'm very satisfied with this Linksys combo, & the 3 year warranty is a big plus. I love the WRT54G which I have bought for my home a year ago. I am a college student and just bought another one since I moved off campus. At first, I had trouble deciding between the WRT54G or the WRT54GS( with speedbooster). From first glance, the speedbooster tag seems enticing since everybody wants fast wireless transfers that would hopefully come close to wired networks. After reading some reviews and speaking to my best friend who works for Linksys , the only difference between the WRT54G and the WRT54GS is the flash and Ram memory. It is an upgrade from 4mb to 8mb for the flash, and 16mb to 32mb for the Ram. Basically you wont surf the internet any faster. The benefits of this is just transferring files from one computer to another will increase. For those who just want to share an internet connection, stick with the WRT54G and save the extra 20 bucks for a 30 pack of beer. If you like to transfer files between computers, spend the extra dough. I had trouble installing one of the PC cards. Tech Support must be in India and there was a serious language barrier going on when I called. (At least three times I said "I'm sorry sir, I can't understand what you are saying!!!). After I described the problem several times (setup wouldn't run to install the card), he still was having me troubleshoot the router. I got frustrated and hung up. Long story short, removing and reseating the card fixed the problem. The router was fairly easy to set up and the only major problem I had was getting decent signal strength to a PC that was fairly far away. The PC housing is actually in the way of the signal, since the antenna is somewhat "hidden" behind the PC, so I kind of expected it. Might need an antenna extension to increase the signal strength a little more, but repositioning the router and antennas seemed to help a little. Our laptop works all over the house and my PC (same room as the router) is fine too. No problems with the laptop card. WARNING: The default router settings leave you pretty open to hackers, so change your SSID to something less obvious than "default", turn off SSID broadcasting and use MAC address filtering as soon as you can change those settings! Write down your MAC addresses before you install the cards; it will save you some time trying to get them using Windows. I don't have any data to support this, but the reliability seems to be better after I installed SP2 for XP. I can't remember the last time I had a problem connecting and it happened many times before I did the upgrade. I either couldn't connect when I booted, or it would just drop during the middle of something. I think I remember hearing that SP2 had better wireless support. The parental controls feature works great when it's actually working (and it's nicely priced), but it was flakey during my free trial, so I didn't sign up. When Parental Controls are turned on, it appears that all Internet traffic gets redirected through their Parental Controls server. Guess what happens when that server goes down? You either have (1) no access or (2) unlimited access. When I emailed Tech Support, they said they had never heard of that problem (yeah right, even a popular Internet reviewer mentioned it in their review). One more thing, you either have Parental Controls for everyone on the router or no one. So, Mom and Dad have to log in on their PC's if you want your kids to surf safely. A smarter move might have been to use a MAC filter to only have Parental Controls on certain PC's. The reporting options outside of Parental Controls are next to nil. You get a weak outgoing log that only lists IP addresses. It doesn't even appear to be accurate, from what I can see (entries missing?). Tech Support said they don't have a utility to pull better logs yet (They do have one for earlier Linksys routers). I have never installed a wireless network before, so I can't give you any comparisons to other manufacturers. However, setup and speed are very good to excellent. Tech support stinks. Parental Controls will be very good if they get their servers to be more reliable. ***Update 9/8/2006: After about two years of usuage, I think I have figured out that my cordless phone (also 2.4 GHz) is interfering with my wireless connection!!! I had an existing Router and Wireless access point from Linksys, the router started acting up so I decided to replace both of them with this wireless router. The key is to get an Internet connection from your DSL modem directly to your computer, once you can get online the rest is cake. I unplugged my main computer from the old router and plugged it directly into the Verizon DSL modem. Turned on my computer and was able to get online immediately. Once you can, insert the CD that comes with this router and follow the instructions. It checks for the Internet connection, and instructs you to then plug in the router. It took few seconds for it to recognize and configure the new router, it then installed some basic security setting for me. It automatically let my computers that are hardwired to the router access the Internet also. The wireless devices that I have had to be changed to the new security settings, unless you use your old security settings again. The thing that bugs me is that it doesn't tell you how to log into your router from the web browser. I know from experience so I did it automatically. This is important because you should always change the default password, or anyone could log into your router and change it. Becuase the default is widely known. To change it, go to your web browser, type in 192.168.1.1 in the address field (without the http://), when a box pops up the log in is: admin and the password is admin. CHANGE THE PASSWORD. Even if you do not set up wireless security, you should, but if you don't at the very least change the password and write it down so you don't forget it. When you are logged in it is a good idea to set up the security settings for wirelss access. You can find some good intructions on the Linksys website. If you don't do this anyone in your neighborhood may be able to log in and use your Internet connection. A friend of mine had this problem and someone had also changed the default password. I recently purchased the Linksys wrt54gs router upon the recommendation of our firm's IT manager. We use this same router in our business office. I am using this one in a 3000 sq ft home and the router covers the entire house with an "excellent" to "very good" reception (54mps). It does take a little while to hook up. 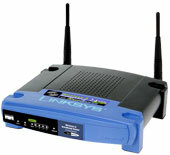 AND, this is important - it is much easier to hook up the router using a program download from the linksys.com web site. The program will walk you through the set up process and program the router for your system. I figure Linksys created the program to reduce all the time their technical people were spending with people like me. In fact their technical support recommended the program instead of the cd. So skip the cd that comes with the router and don't mess with the "easy set up button"; just use the free download. Also, if you're a novice like me you need to know that you program the router using your internet browser. The address is in the manual. Finally, be sure to set up the security features otherwise your wireless network will be open for anyone within range to connect. Return to top of "Linksys WRT54GS Wireless Router with SpeedBooster"! !